It was a foodie day extraordinaire, Grace! Everything looks delicious-you did great with your photos even tho your brother chowed down while you were trying to take them. Also laughed at Herwig's sign. :) And those burgers...OMG. Always nice to have some lovin from Mom and comfort food to boot. Fun day! Wow it all loooks AMAZING!!! And that sign is hilarious!!! How fun! It sounds like it's a meal for all of your senses. That chicken does look good. wow, what an amazing place--it looks great. but with those serving sizes I don't think I would a clean plate ranger. You were kind of in my old neck of the woods. I grew up nearby and have spent many a day in State College. 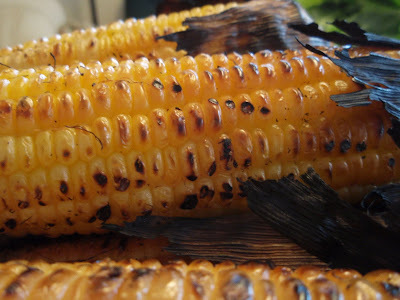 Did you get to pop into any of the neat little shops in between keeping your belly full? Holy smokes...that's a tremendous amount of food. 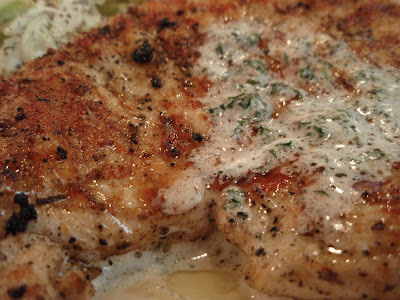 Love the photo with the herb butter melted all over your chicken. 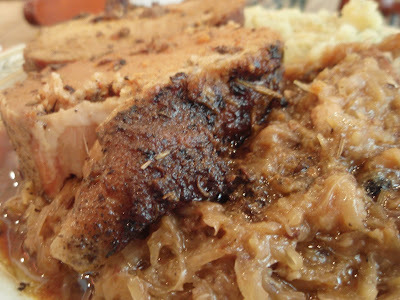 I've grown to love sauerkraut over the past few years and all of that food looks delicious. 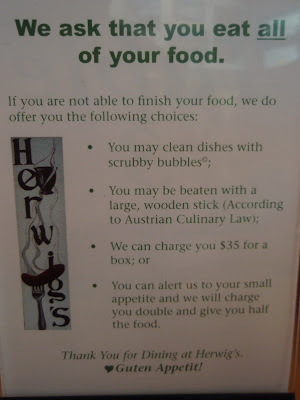 Herwig's sounds like fun! I haven't had good German sauerkraut or potato salad in ages. I want to try that whole pig's leg! All the dishes here sound amazing! Oh man, that kraut looks spectacular! 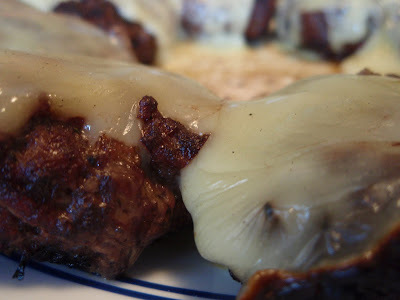 Consider this place on my list of restos to try! wow Grace! That's a lot of wonderful looking food in one post! I absaloutly LOVE LOVE the sign. I want one for my kitchen! If I'm ever up that way, I'm going to try that place out...and the throwing of the pigs cracks me up because here in the office we throw penguins at each other. Haha! I'm sorry for not commenting more often. I do try to read! we have a resto in montreal with a similar idea -you've got to eat all your food, or you're charged extra. however, they're a strictly vegan resto, so i guess that's where the similarities end! that looks like one meat-heavy table, just the way i like it. awesome place, i'd love to check it out. That sounds like tons of fun and a great place to work! And good food in the mix and it would be heaven for me! Fun sign:) Maybe too much meat for me though..ha! There is nothing in the world so much fun as a restaurant with a good sense of humor. Those seem to be the only ones you clearly remember years later, even when the food has disappeared from memory. What a fun restaurant! The food looks tasty and I really love the servers have a sense of humor. But did he have to pay $35 for the box? I'd have sneaked one in. I always want to do that at Chinese all-you-can-eat buffets; sneak in some tupperware under my coat... But in this circumstance I think I'd just take it for the team. Nice going on finishing yours! The dishes are huge!! Love it. The rules and being pelted with plush pig toys sold me! Can we keep the toys? All that food has me drooling; what a time you had! That chicken and roasted corn look very tempting...the sign is sooo funny! All in all, I'd say you had a great time with your family. Believe me Grace, you will never get too old that your mama won't want to take care of you! How I would love a place like this in my town OMG...so, so awesome. I love that they hit you...with pigs even! I love that sign! It would be perfect to hang in any kitchen. I am so glad you got some good lovin' Grace! Whew what a restaurant. It is place where you better bring all of your appetite, eh? Food looks so good in that restaurant. What a good time you must had with the family. Wow! Es ist sehr schön! I'm jealous! Gotta love a place with a sense of humor - and the food looks pretty good too! I would so love the experience. I know that I love the food! Different approach to dining! YUM! I don't know if I could finish all that food... but I'd certainly have fun trying! Das is sehr Überraschend! 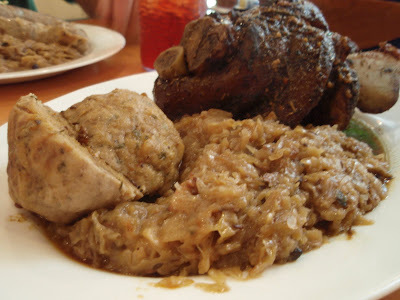 We´re still in Germany, and the restaurants are all featuring the seasonal plate of Haxen and Knödel. 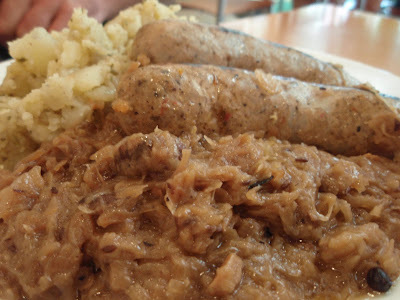 Yesterday I had a bratwürst for lunch. Sehr gut! Sounds like my kind of place. Sounds like my kind of mammy too. Does she adopt? Pig Heaven! A nice "light" meal...that's right up my alley! I love that food,and it sounds like you had a great weekend. I don't even have any words. Wow, I don't think I can finish all, but sure would like to try :-) They all look so yummie! My hubby would love this place! It sounds like a fun restaurant with a lot of character! Everything looks so good. specially the bratwurst! I could get used to a place like that. Hah that sign is amazing. It sounds like everyone's grandmother yelling at them for not finishing. Love places like that! We have a German restaurant tucked in the mountains of NC that I need to blog about soon. Glad you got a dose of Mamster's cooking! Love this! And just LOL-ed! I have eaten here! It is, indeed, delicious and totally entertaining!